The Mets have become Club Med and the injuries are all-inclusive. On a day when they won their eighth straight game, the clubhouse had the atmosphere of an infirmary. 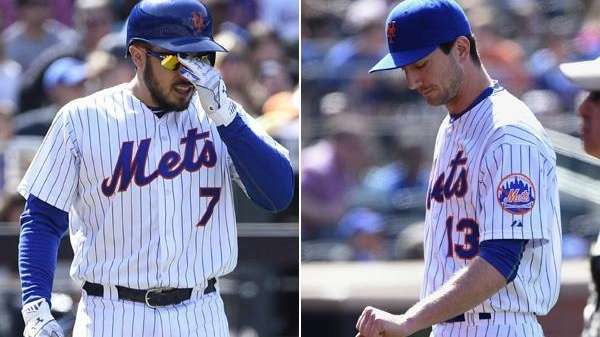 The new walking wounded were Travis d'Arnaud and Jerry Blevins, both of whom will be lost indefinitely with bone fractures suffered within minutes of each other. The new injuries added to the list of existing ones that range from season-ending Tommy John surgeries for Josh Edgin and Zack Wheeler, an uncertain timetable for Bobby Parnell and Vic Black, and David Wright's disabling hamstring injury. "Well, it's not a good day," manager Terry Collins said Sunday after a 7-6 win and four-game sweep of the Marlins that gave the Mets a franchise-best 7-0 start at home. "It's a good day, we won. We'll take that away and we'll just build from this day. But it's a tough day for us, certainly." It started off as what seemed to be a great day for the Dark Knight as another big crowd gathered for Matt Harvey's start, also known as Harvey Day. Unknown to most was that he was sick with a sore throat. "The last thing I wanted to do was give up a start," he said. "It was a battle." Harvey improved to 3-0 but needed help. He trailed 1-0 until the fourth inning, when the Mets scored seven runs against former Stony Brook University pitcher Tom Koehler. The big hit was a three-run double by Ruben Tejada. D'Arnaud had two singles in the inning and leaves hitting .317 with a team-leading 10 RBIs. "I think the offense did all the talking," Harvey said. "Going out there with that much run support, for me it was wanting to battle through it, keep throwing strikes and get us back into the dugout as quickly as possible." Harvey lasted until the seventh, when he gave up three straight none-out singles to make it 7-3. But when the Dark Knight departed, the shadow of injury was lurking. Blevins, the lights-out lefthanded specialist acquired from the Nationals to replace Edgin, got pinch hitter Ichiro Suzuki to line out. Dee Gordon then hit a liner back at Blevins, fracturing his left forearm. "I didn't actually think it got me that bad," said Blevins, his arm in a sling. "It wasn't hurting that bad until an hour later. They told me it's broken. That's as much information as I needed." D'Arnaud, leading off the bottom of the inning, suffered a fractured right hand when he was hit by a pitch from A.J. Ramos. "I just thought it hit the muscle, but you know, what can you do?" said d'Arnaud, his hand wrapped in a soft cast. " . . . It's not fun." The bullpen leaked a bit until Jeurys Familia closed it with flair, retiring Giancarlo Stanton on a grounder for the final out with the tying run on second. Blevins and d'Arnaud were scheduled to be examined Monday. GM Sandy Alderson said catcher Kevin Plawecki and reliever Hansel Robles were being called up from Triple-A Las Vegas. "These two injuries don't make it any easier," Alderson said, "but I think the same attitude, the same commitment and determination is going to keep us moving ahead. The most important thing here is not who are replacements but the atmosphere they will find when they get here." Harvey, his voice low and subdued, added, "We had such a good spring training and start of the season. For us, we can't let it affect us. We still have to go out there and give it our all every day . . . We still have to win, go out there and compete and pick up where we left off."